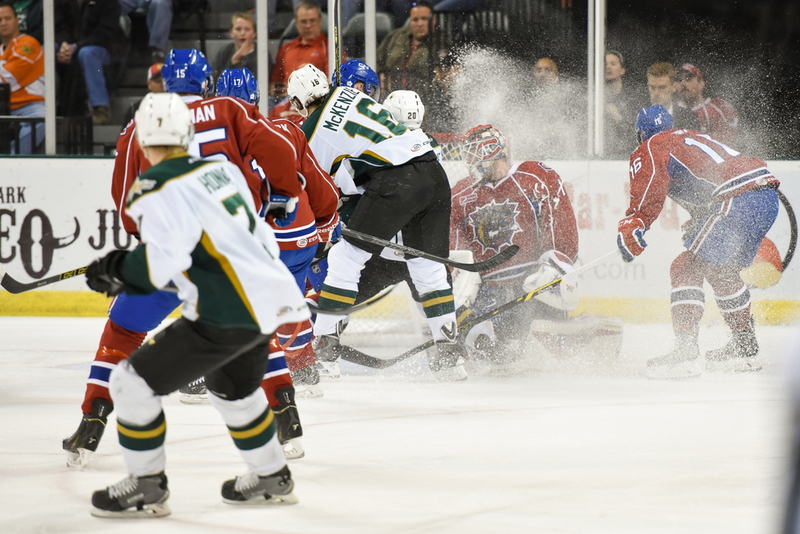 It was back to back games for the Texas Stars this weekend as they faced the Hamilton Bulldogs on Friday and Saturday nights. 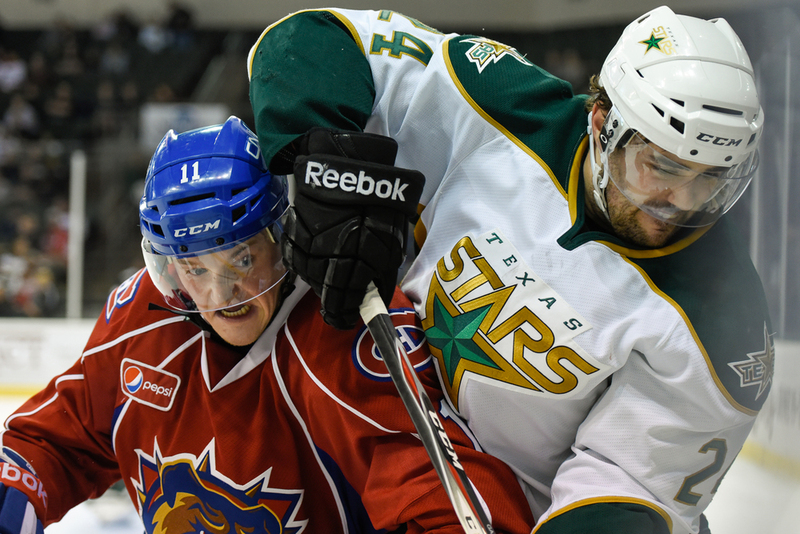 The Stars were looking to earn a single point in order to clinch a spot in the Calder Cup playoffs. I'm happy to report that a win last night got the team the points they needed to stay in 5th place in the AHL Western division and guarantee that they will be in the playoffs to defend their possession of the Cup! The Friday game was a thrilling battle with goals being exchanged while both teams pushed hard in the late season. Unfortunately, the Stars fell to the Bulldogs 4-3 - not for lack of effort. The first shot is Matt Mangene battling for the puck as the Bulldogs drive toward the Stars net. The second shot is a small blizzard hitting Bulldog goalie Mike Condon as Curtis McKenzie and Brett Richie charge his net. Great effort but the puck didn't find the net. The third shot is Jamie Oleksiak taking down his man in the final minute of play with the Stars net open. The empty net goal was thwarted and I was a little surprised that a penalty wasn't called. 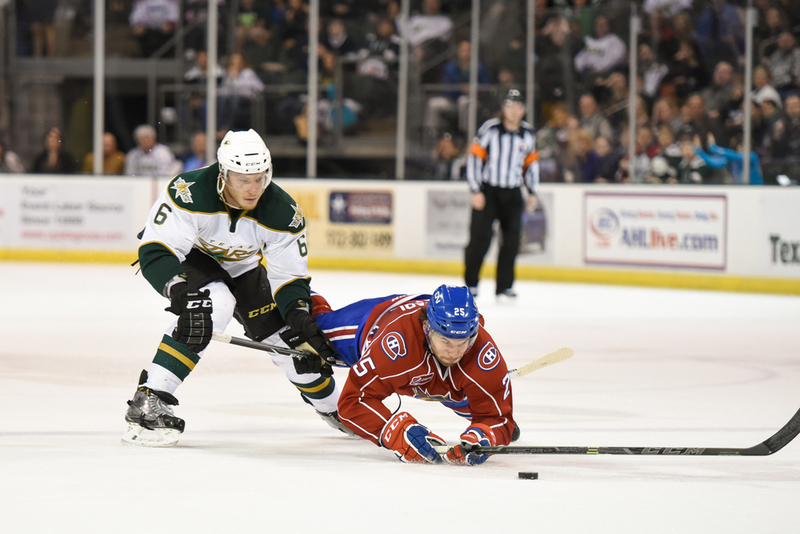 The Stars came back with a vengeance on Saturday, soundly defeating the Bulldogs 5-0. Jack Campbell was in net (Jussi Rynnas played Friday) and turned away what few scoring chances the Bulldogs mustered. 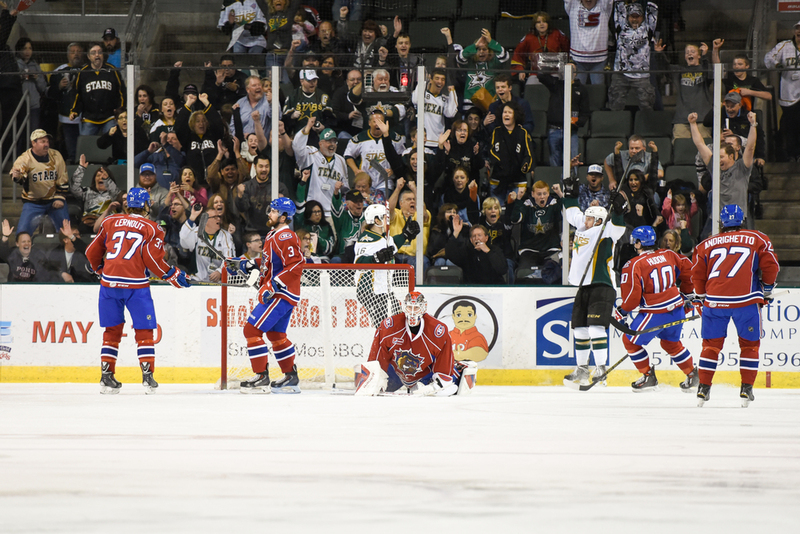 The Stars drove hard to the net all night long and were rewarded with 5 unanswered goals. The first shot is the celebration of a goal by Justin Dowling. It was the second goal of the game and it came quickly after the opening goal by Devin Shore. Condon, in net for the Bulldogs, appeared to be stunned. The rest of the night wouldn't go well for him either. The second shot is Jack Campbell twisting to make a save. He looked great in net and held the Bulldogs off all night. The third shot is Cameron Gaunce battling for the puck in the corner by our net. This was an instant before they crashed into the boards and you can see the edge of the plexiglass as I was backing up from the lens hole! There are some close calls sometimes getting shots like this!